I wonder how many Abba fans are aware that this track happened. 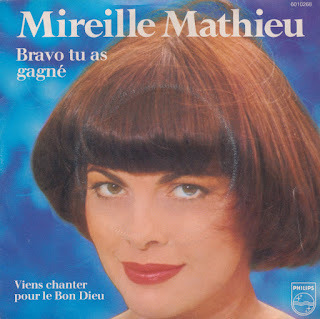 I don't recall any news items about this back in 1981, but it is pretty astounding that Benny, Björn and Frida contributed backing vocals to 'Bravo tu as gagné', a French cover version of their then-recent hit 'The winner takes it all', recorded by Mireille Mathieu. The back cover of this single even shows a photograph of the four in the studio. Why Agnetha wasn't present, I don't know - she was probably sulking at home somewhere. The song was actually produced by Benny and Björn as well, which makes it almost an Abba single. I found this single while shopping online. It was a big surprise for me, especially since the single wasn't particularly expensive. You'd think that any rare Abba track would fetch a lot of money. The singing aspirations of the actors from the popular evening drama 'Dallas' has led to some pretty embarrassing results. Readers of this blog have already heard the single by Charlene Tilton, and here is another shocking example. 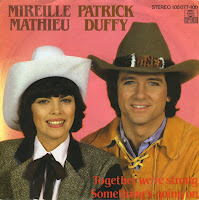 Mireille Mathieu and Patrick Duffy recorded 'Together we're strong' in 1983 when Duffy appeared in Mathieu's French television show. The song, which was written by Ralph Siegel and Richard Palmer James, was released as a single and, unbelievably, became a hit all over Europe. In the Dutch Top 40, 'Together we're strong' landed at number 5. I bought this single strictly for its comedy value.